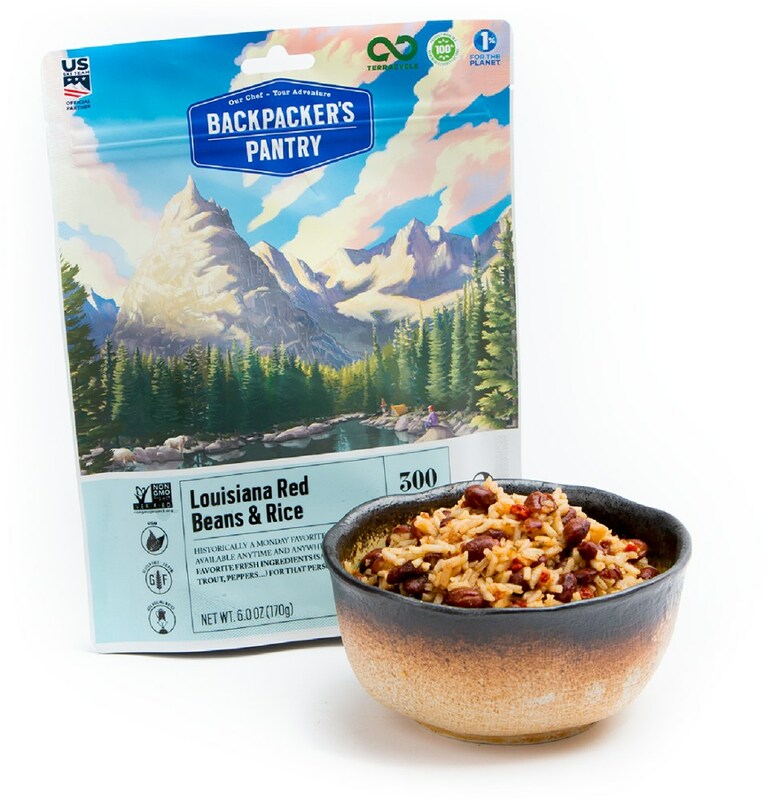 This is a fresh, healthy, and tasty alternative to the every growing line of pre-packaged backpacker meals. 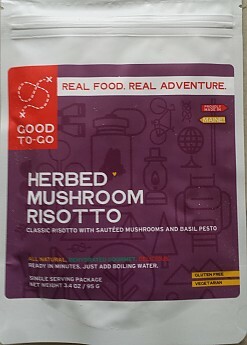 While the recommended re-hydration period is quite a bit longer than other similar products, my sample of the Risotto did not take as long to re-hydrate as the other two meals. I would highly recommend this product for those looking specifically for an all-natural, vegetarian, gluten-free option. 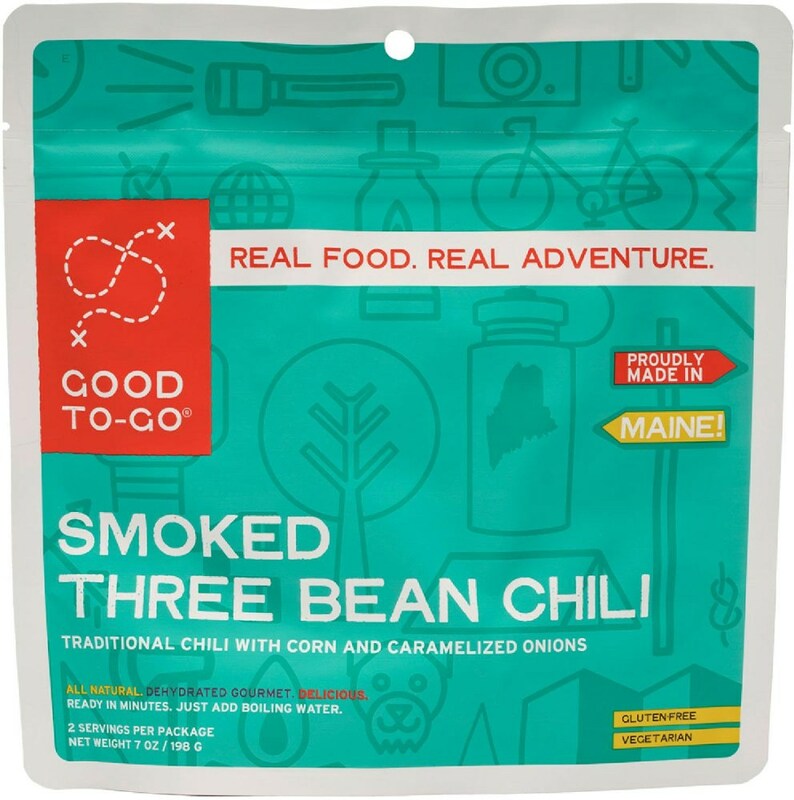 A note: I’ve included some of the same commentary for all three Good To Go reviews: Smoked Three Bean Chili and Thai Curry and Herbed Mushroom Risotto. For particulars of each meal, skip to the section titled 'Taste'. Here's what was included in my sample box...note the bonus 'happy' beverages! About Me: I have progressed somewhat in my backcountry cuisine habits but will never achieve true greatness. You won't likely ever catch me porting fresh, raw ingredients into the wilderness to ingeniously craft baked goods in a dutch oven. I’m just not much of a cook at home and so my choices in backcountry foods are even more basic. I also like to travel light, fast, and for long distances, which just doesn’t equate to grand culinary efforts. 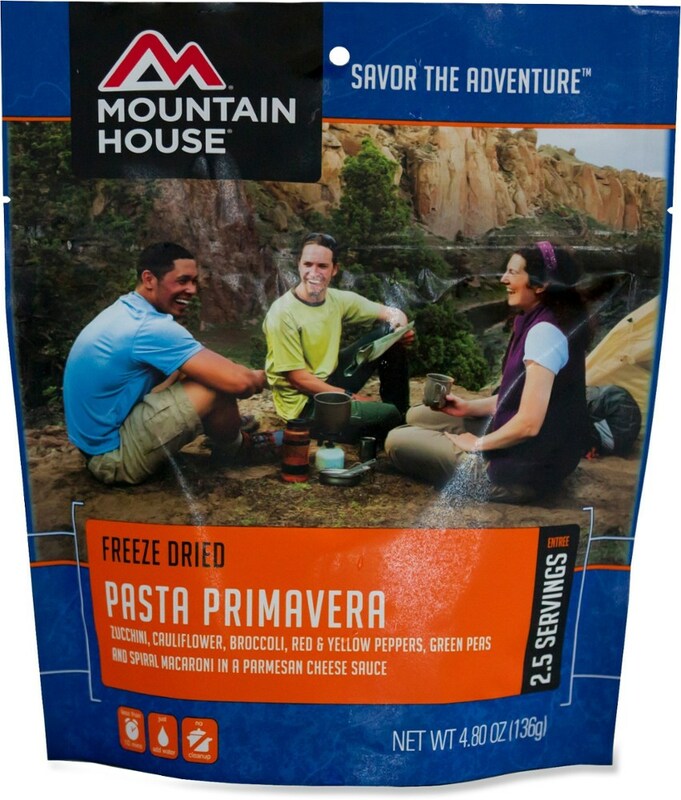 For years, my budget for three square meals on a backpacking trip consisted of 1-2 Clif bars for breakfast and lunch, then a pasta side mixed with tuna for dinner. Oh, and don’t forget the desert chocolate! I’ve added in the usual suspects such as dried fruit, nuts, beef jerky, etc., but my strategy has always been very minimalistic. Where many are willing to carry more weight in order to have fresh food, I always saw this as an opportunity to cut weight. Fortunately I’ve also been able to get by doing more for less in terms of caloric burn/ intake, at least for periods up to a week. But I realize this won’t work for everyone nor would it probably work for me if I were to ever take on an extended thru-hike. 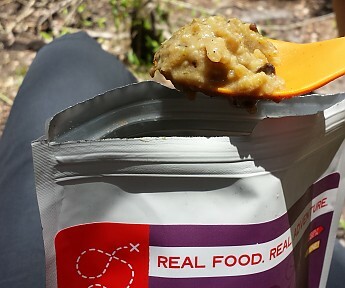 The area where I stand to realize great improvement is in the quality of the dehydrated foods that I carry in my pack. 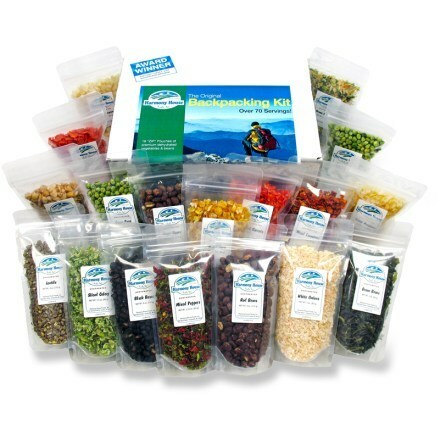 A few years ago I started upgrading from the ramen and pasta packets to the trendier purpose-made meals, the likes of Mountain House and Backpacker’s Pantry. While it’s true that most of these options provide very lightweight, quick, easy, AND tasty/filling meals, they’re still not exactly what you’d call healthy. Mainly they’re chocked full of sodium, some with as much as 45% DV per serving! These, like so many packaged foods, also tend to have a lot of artificial ingredients and preservatives. 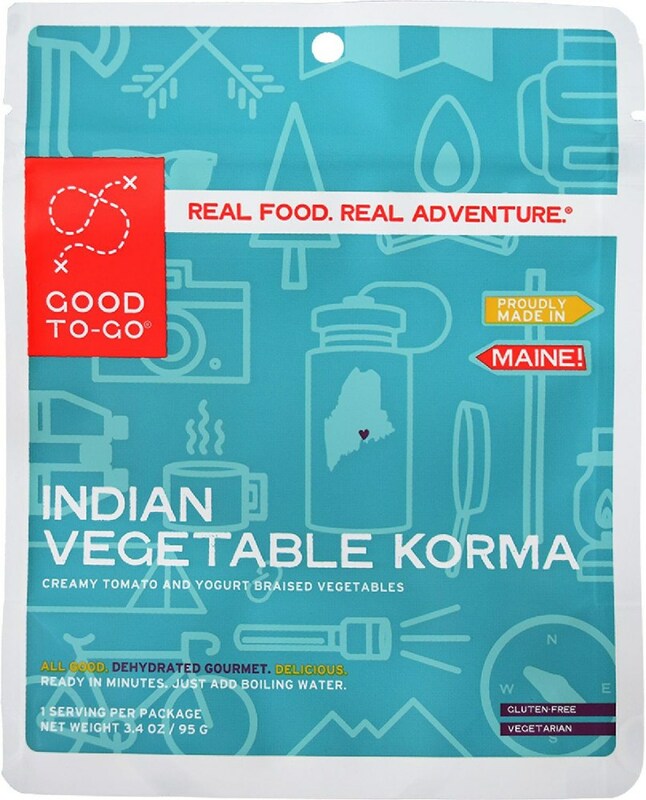 So I am glad to see a small, family owned start-up company like Good To Go filling the niche of healthier, more natural backpacking meals. They have taken all the benefits of the self-contained packaging and filled it with more nutritious, better-tasting, real food. Taste: The Herbed Mushroom Risotto was the last meal of the three that I tried. The other two appealed to me more, just out of personal preference. But I did find the risotto to taste well and have an appealing texture. 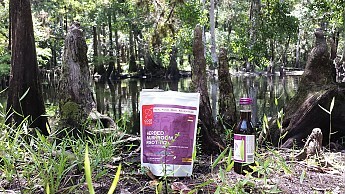 Rather than just having mushroom flavor, there are dried mushrooms that greatly enhance the meal. 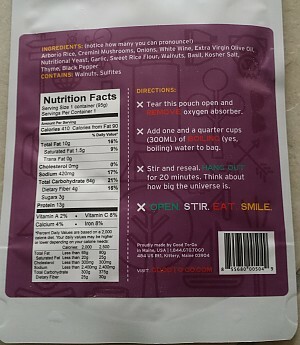 I did find it to be a little bland and would consider adding some more black pepper to spice things up (but not salt, as there is already enough at 410 mg per serving). I felt this meal would go best as a side dish, perhaps with some freshly caught fish. Or you could add some nuts, packaged tuna, etc. It also went well with the single-serving red wine that came in the sample box. Prep: The 20 minute recommended re-hydration period is probably the biggest downside to the Good-To-Go product line. This isn't a big deal if you are settled down in camp for the night. The package can be sealed and set aside while various other chores are accomplished and the time will go by quickly. The package suggests that you ponder ‘how big the universe is’…good advice I think. The risotto took the least amount of time to re-hydrate, compared to the other 2 meals. I tested it only 10 minutes after adding boiling water and found all the ingredients to be of good texture and consistency. It might take even less time, if you're really in a hurry, but I think 10 minutes is a reasonable amount of time to have to wait. I went for a swim in the creek while I waited, which was very refreshing. Packaging: The packaging is top notch. I didn’t struggle to open it, it sealed easily, and the bottom expands sufficiently in order to stand upright unsupported. I was impressed by how slim and compact the package is compared to other similar products. I would note that in this picture, the sample is being compared to double-serving packages, so it’s not a fair comparison. But it does give you an idea of scale if you’re familiar with these other products. My only suggestion would be to include a fill line on the packaging to know how much water to add. I tend to just pour water in until it ‘looks good’…so perhaps it’s time I invest in marking lines on my pot. I had the risotto for lunch as part of a day paddle on Fisheating Creek. I brought other food but after the meal, I felt satiated. I did have one energy drink (plus the supplied 'happy' beverage) along with the meal, but that was it for the rest of the day. So I'd say the meal was quite satisfying, at least for lunch. Since I’m used to eating very little during the day and then splurging on double-serving meals for dinner, I would probably opt for the same strategy with this product. That or bring other foods to pair it with. I’m not a vegetarian so I would probably consider pairing it with fresh-caught fish or some sort of packet protein like tuna. 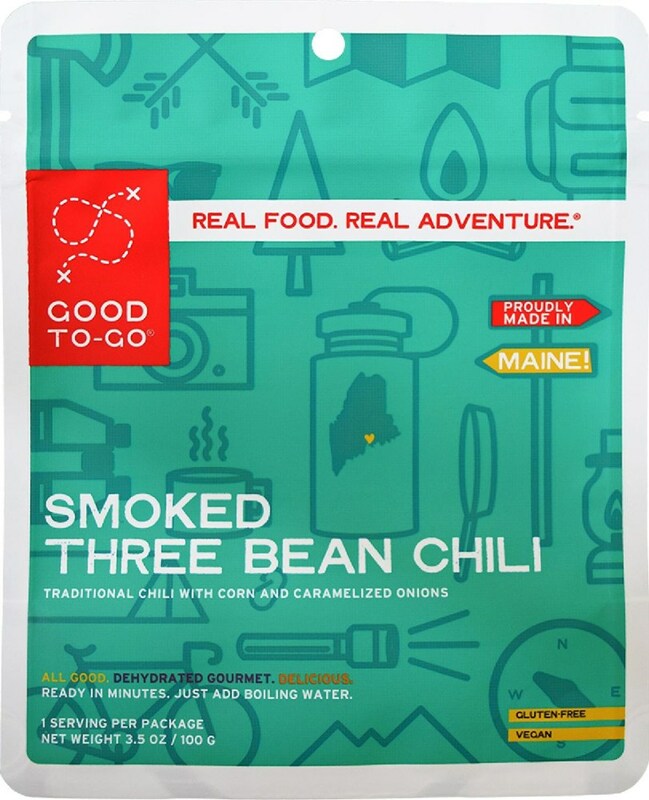 I did note that of all the various meal samples I have on stock, the Good To Go meals have by far the most calories per serving, from 340 to 410. If you’re looking for better bang for your buck in terms of caloric density, these would be a good choice. However, at around 3.4 oz per serving, they are not quite as lightweight as some of the others (though still plenty light for backpacking). All three Good To Go selections are both gluten free and vegetarian (except the Thai Curry, which is pescatarian). They are advertised as being ‘real food’ and in reading the ingredient list, this claim is not exaggerated. 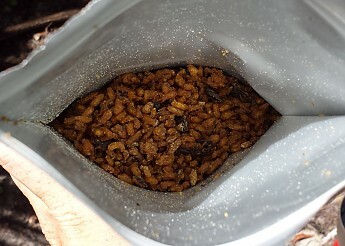 A look at the contents before adding water. The dark bits are the mushrooms. I would also point out that the three selections are generally much lower in sodium than their counterparts. 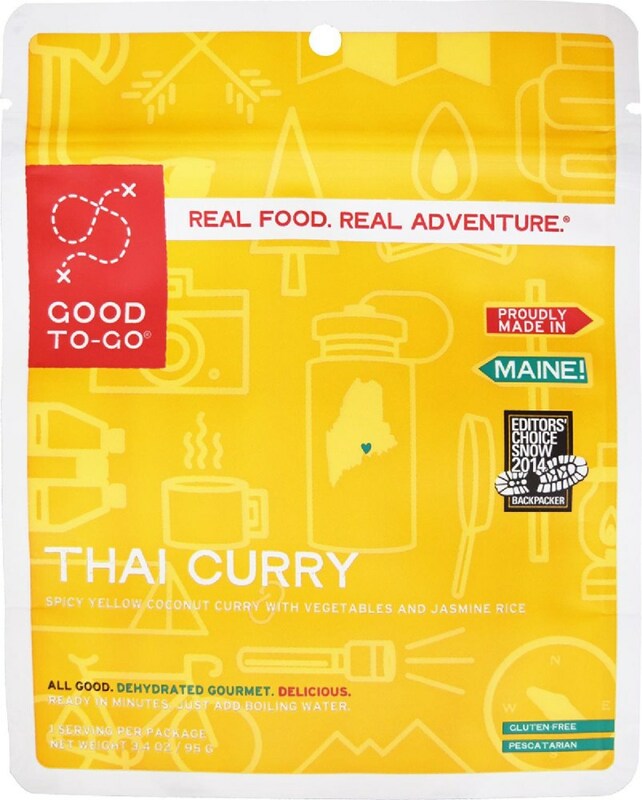 The Thai Curry has the most at 500mg, the chili has only 360 mg and is also pretty is high in protein at 16 g. So in my experience, these meals did provide a fresh, healthy and tasty alternative to the every growing line of backpacker meals. 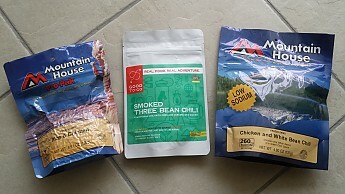 Best For: I would recommend these products especially for outdoors people that are particularly conscious of food ingredients. My friend Megan is a good example. 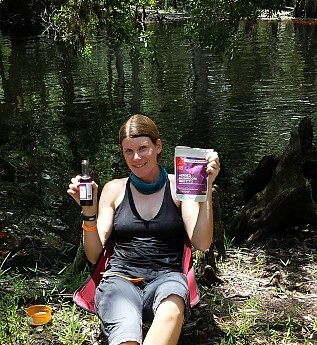 She loves the outdoors and also enjoys spending hours prepping amazing foods for the trail. She is vegan and thus has to essentially create all her own meals from scratch. Knowing this, I asked her to try the risotto. She also agreed that the taste was great for a pre-packaged, dehydrated meal. Final thoughts: Aside from the good taste and nutritious nature of the products, I also like the idea of supporting small American businesses. 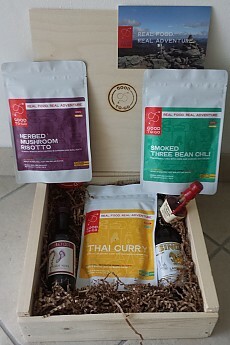 The co-founder of the company, Jennifer Scism, is a former New York City chef who now resides with her husband and business partner in Maine. It's the little things, like a handwritten postcard from Jennifer included in my sample package, that impress upon me the sincerity and genuineness of such small businesses. As always, I thank them and Trailspace for the opportunity to do some TASTE-testing (my favorite kind of gear testing!) and I wish them all the best in their new endeavors. Interesting flavor, just like the other two varieties. Looks yummy and l like the "real food" aspect too. Thanks, Lah! Thanks for your review Leah! Nice review, Lah. It sounds delicious! Looks like your enjoying your meal. cheers! Great review! Man, I need to find the happy beverage gear! Nothing like a warm, tasty meal when you're out in the cold and Good To-Go goes above and beyond! The risotto is fantastic — lots of mushrooms, lots of flavor, yum! Works great at ski lodges since all you need is hot water — you can have a great, gourmet meal in the lodge without forking over a fortune for the overpriced slope side fare. Full disclosure: I am friends with the owners of Good To-Go. I've had the opportunity to sample these recipes as they were evolving before production, and Jen keeps making them better and better! What you've got here is the best recipe yet. Another super yummy meal, you really can't go wrong. Another super yummy meal, you really can't go wrong. No more Annie's mac and cheese. Again it's made fresh, is the real thing, and is simply dehydrated, so when reconstituted you get back a meal that has been lovingly prepared. The author of this review is an investor in Good To-Go. Fantastic stuff, easy to make, rich, substantial, good enough to eat and serve at home. If I camped or hiked and had this to look forward to, the only thing keeping me from the outdoors would be the mosquitos. And bears. And snakes. And Unabomber. Deadfall. Volcanic eruptions. Blizzards....sorry, got distracted. DISCLOSURE: I am in investor in Good To-Go and have a relationship with the owners.